The brand new Tamarack Trades Training Centre will provide top notch training and skills development in the trades for at-risk youth in the Ottawa area. With YOUR help, up to 300 at-risk youth will be trained each year. Donate today to help outfit the centre! 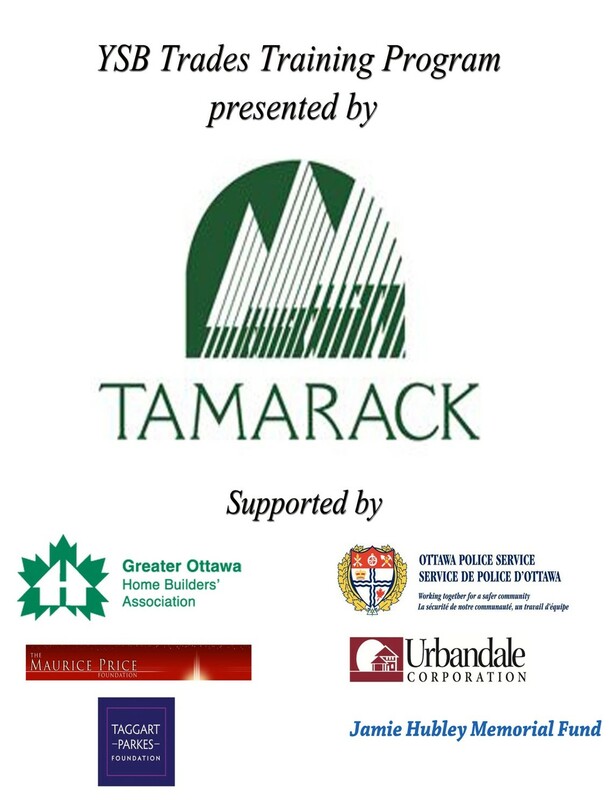 Tamarack Trades Training Centre Program is presented by Tamarack Homes and supported by the Greater Ottawa Home Builders’ Association (GOHBA), the Ottawa Police Service, The Maurice Price Foundation, and Urbandale Corporation. Co-Chairs Scott Lawrence and Mark Patterson have each individually offered a $25,000.00 Matching Gift! Youth in crisis face challenges that are hard to imagine. There are many different factors that can jeopardize stability in a young person’s life. Often having left home situations that are abusive, unstable or inappropriate, youth abandon their education when food and shelter become their main concerns. Very quickly, while living on the street, young people can fall into street culture and the issues can multiply – drug addictions, prostitution, and crime can seem like easy solutions to the poverty, isolation, and hopelessness that many youth face when they live on the streets. These are the young people who will benefit from the Tamarack Trades Training Centre. With your support, the Tamarack Trades Training Centre will teach at-risk youth marketable construction trades skills that will help them become wage-earning citizens, instill a sense of confidence and excitement about their futures and provide them with viable career path options. The focus of the program is to provide graduates with the skills they need to gain entry-level employment in residential and commercial construction. The program includes hands-on experience, demonstrations and provides students with a basic understanding of the trades. The program will also provide students with safety training (general and specific) and skills development in a number of the construction areas. Through this program at-risk youth will explore the following trades; welding, electrical, automotive and small engine repair, carpentry and woodworking, etc. Tamarack Trades Training Centre Program in presented by Tamarack Homes and supported by the Greater Ottawa Home Builders’ Association (GOHBA), the Ottawa Police Service, The Maurice Price Foundation, and Urbandale Corporation. Thank you! !